For our August trip we were 'Drawn to the Valley' to see the work of local artists around Hatt, Callington, and Drakewalls. An amazing fourteen of them at six venues. Some of the artists were present to help us understand their work and what inspired them, also to explain their methods. Their use of materials was exhaustive. Reflecting on how much time, experiment and learning, in addition to the talent and materials, we were surprised how low the prices were - even so only cards were purchased! We found the venues themselves of interest, a motel, a village 'centre' by old mine buildings (we explored), a sawmill with beautiful use of their timber to renovate barns. Working studios, one down a bumpy track in fields another with a lovely garden in town centre. But we were all charmed by a tiny cottage where fairy dust was sprinkled! As always, we enjoyed being able to share our observations and discoveries - oh yes! - and necessary refreshments! More information on the Drawn to Valley website. Programme for August until December. Tuesday 12th August - Plymouth Art Gallery. Exhibition of prints by Matisse, Picasso, Dali and Warhol. Travel by train on 10.49. Chance of lunch in Bistro One if we pre-book so numbers needed. Contact Pat. Also alternative date 5th August, same train. Choose your date and turn up. There will be people going on each date. Thursday 11th September. Tate Modern at St Ives. Travel by train, times tbc. Thursday 16th October. Penlee House, Penzance. Leonard Fuller, portrait and still life painter, founder of the St Ives School of painting. Travel by train, time tbc. Contact Pat. pat.stearn"AT" mypostoffice(dot)co(dot)uk or 01208 872138. Wednesday 12th November. Lander Gallery, Truro. A Cornish Life, life in Cornwall captured in paint. Travel by train, time tbc. Monday 1st December. A visit to Plymouth’s historic Synagogue. Built in 1762 it is the oldest Ashkenazi Synagogue still in use in the English speaking world. Details and cost tbc. Contact Pat for more details. Friday 5th December. Lunch at Duchy Nursery Shop. Please let Pat know if you want to come as we will have to book a table. 12noon. Lifts by car available. Art Appreciation have been a bit quiet recently but we had an excellent trip to Truro on 23rd May to see the Art College A level work, followed by a visit to the Museum to see “Amongst Heroes” a selection of paintings showing Cornish people at work. We had a very good guided tour by one of the curators but we were only able to see half the exhibition as the other gallery had a leak through the ceiling caused by the previous day’s heavy rain and was closed. Even so it was an excellent trip. We have our trip to Falmouth on 3rd July to see an exhibition called “The boy who bit Picasso.” Our next general meeting is on Tuesday 22nd July at The Platform at 2 p.m. to arrange our programme through into the autumn and early winter. On Friday 21st March a small group of us drove up to near Newton Abbot to Seale Hayne, where there was an exhibition of paintings by Robert Lenkiewicz. These paintings were all from private collections owned by members of the family, many of them never seen before. The theme was obviously “family”. It is a social enquiry of sorts but also a celebration of the images Lenkiewicz made of his family. Married three times and with many mistresses he fathered at least 11 children. Many of the pictures were rough sketches for a bigger work or only partially finished. Some of us found one or two of the pictures quite disturbing, particularly the one entitled “Robert presenting his entrails.” However if you move your gaze to the right of the picture the portrait of his then wife Annie Hill-Smith holding the sleeping child takes on a totally different aspect. The child is soundly asleep and is heavy; a beautiful depiction of a mother and child. Their other son is also soundly asleep on the sofa. I think that Lenkiewicz deliberately set out to shock us but then softened the impact with the tender portrait. The other picture that some of us found disturbing was the one entitled “Kate aged 7 sitting of Robert’s knee.” I leave you to draw your own conclusions. We had much to think and talk about over lunch but we all agreed that it was the most fascinating exhibition. 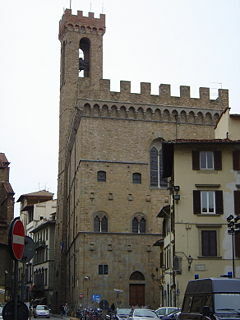 On Wednesday 12th March 10 intrepid U3A members set off for Florence. Our flight from Bristol was on time which enabled us to catch a coach from Pisa into the centre of Florence. A short walk from the coach station we found our hotel in a quiet back street. Just time for a quick wash and brush up and we were out for dinner in a local trattoria. Having had a very early start we were all thirsty and hungry and large quantities of beer and wine were consumed along with generous plates of pasta and delicious meat and vegetables, all cooked fresh to order. breakfast we set out on a short orientation walk along the river Arno. We crossed the Ponte Vecchio, noted for its jewelry shops. Although the workmanship is exquisite the prices are high so no purchases were made. A slow amble up stream brought us to the loggia of the Uffizi Gallery, with its statues of Florentine artists, sculptors, politicians and soldiers. The sun was shining and it was coffee time so we found a pleasant open air café and relaxed before visiting the National Museum which is housed in the imposing Palazzo del Bargello built in 1255. This contains an impressive collection of sculptures by Donatello, Michelangelo and Verrocchio as well as other Renaissance artists, along with medieval military paraphernalia, and ceramics by della Robbia. By the time we had viewed all these wonderful objects the museum was about to close and fearing that we might be locked in we left and went in search of lunch. Again we found an open air café and soaked up the sunshine while drinking beer and eating pizza. The afternoon was taken up with visiting the 14th century church of Santa Maria del Carmine, which contains the Brancacci chapel to see the frescoes by Masaccio, Masolino and Filippino Lippi. When I have visited this chapel previously it has been very crowded, but this time as it was late afternoon it was almost deserted and we were able to admire these exquisite frescoes in peace and quiet. Returning to the hotel we all needed a rest before meeting up for our dinner date. Again we had a splendid meal and returned to the hotel via a small bar where locals were watching a football match between Fiorentina (the local team) and Juventus. Several nightcaps were drunk and the male members of the party had strange conversations in Italian and broken English! Friday was another beautiful day and we left early to collect our timed tickets for the Uffizi Gallery. It is impossible to view all the works of art on show so we concentrated on early art by Giotto and then moved on to the highlight of the visit, the paintings by Boticelli. Although I have seen Primavera and The Birth of Venus many times I am always awe struck by the magnificence of the works. I think we were all suitably impressed. Tearing ourselves away we returned to our coffee shop of the previous day and tucked in to salads, pizza and beer. the Medici Riccardi Palace to see the frescoes by Benozzo Gozzoli. These are painted on three walls and depict the journey of the Magi. It is a monumental work containing many portraits of members of the Medici family, diplomats, who gathered for a conference in Florence in 1439, and philosophers and writers. The artist has also included his own portrait and so there can be no mistake he has put his name of his hat! Saturday was scheduled for a visit to the tombs of the Medici family which contains monumental sculptures by Michelangelo. There is a huge amount of restoration work taking place here so some things were difficult to view, but the main sculptures were visible. In the afternoon we split up. Some went to the Boboli Gardens; some went on the bus tour around Florence. Everyone had a good time. In the evening we went to a different trattoria which had been found by one of our group. He certainly got Brownie Points for his find! Our final dinner was superb and much wine was drunk! Nightcaps did not follow as we had a very early departure time the following morning. We all returned completely “cultured out” but realizing that we had only scratched the surface of the wonders of Florence. Ethel Bartlett 1926 (detail) by Laura Knight. The Estate of Dame Laura Knight DBE RA 2014. 14th – 26th April Exhibition at the Library called “Not for Sale”. This is mounted by us and is an exhibition of our pictures or pottery or photographs that we own and love and what they mean to us. Jenni Randall is organizing this. We will also be inviting other U3A groups and the wider community to submit things. End of March (date to be decided). Exhibition of privately owned works by Robert Lenkiewicz at Hannahs at Seale Hayne, Howton Road, Newton Abbot, Devon. Pat Stearn co-ordinating this. Travel by car. May or June. “Amongst Heroes”. Exhibition at Truro Museum. Jenny Macdonald is organizing this. Travel by train. Early July. Waves Art Gallery in Falmouth. Sandra Marten is making enquiries . Travel by train. Acknowledgement: Aberystwyth University School of Art Museum. The group is planning an art exhibition at the Library from April 14th- 26th 2014. This will be an exhibition with a difference. Titled “NOT for Sale” this is an exhibition of the art we own , display in our own homes, and enjoy for many years. More than simply an opportunity to share these works of art with others, this exhibition aims to explore the stories that attach to these works with others. Paintings, prints, photographs etc that we have bought and continue to own are frequently acquired and kept because of their part in our life story. It is these connections we hope to explore and share. Further details in the coming weeks.